Why do I let myself be sucked in every time?! The clever viral ads, the effects ladened explosions, the utterly insane spaceships, the heroic fightback. I crave it in at least one new film on a yearly basis. Yet in recent years be it War of the Worlds, Transformers 2, The Day The Earth Stood Still and the utterly detestable Skyline - officially my worst film of 2010 - I've always found myself feeling somewhat bitter, disappointed, empty and generally unfulfilled, upon leaving the cinema. 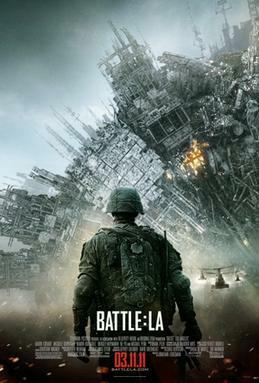 The latest in this sub-genre of extraterrestrial invasion films comes the brashly titled, Battle: Los Angeles. Firstly the good news, the film is thankfully not as bad as that grotesque waste of money, Skyline a few months ago - not even close - despite using the same special effects company. The bad news unfortunately is that the film stops just short of the cast screaming: "AMERICA, F*CK YEAH!" every 10 minutes. The story has the complexity worthy of the Saturday morning cartoons I grew up with as a child. Starring Aaron Eckhart as an US army war hero just returned from Iraq, sent into the front line of the urban jungle of LA to stop an impending invasion from an unknown force. Over the course of the film he succeeds in figuring out what no other member of the entire US Armed Forces could, in gaining the knowledge to bring down this seemingly unstoppable enemy. In fairness to Eckhart he's just likeable enough to get away with the role - if not completely remarkable. Same could even be said for his co-stars, I just don't believe the director, Jonathan Liebesman was able to strike a balance between a ballsy, relentless, no fuss action movie and a truly engaging story. At least Independence Day had Jeff Goldblum, Bill Pullman and Will Smith to carry its obscenity. Where the film really bothered me however was in these tortuously cheesy moments taken straight from the Michael Bay School of Preposterous Film-Making. You know the types of scenes I'm talking about, as they've been featured countless times in the past two Transformers movies: the sunset backdrop, slow-motion climaxes, caught up in the moment speeches and the overly emotional orchestral music. Unfortunately, Battle: LA didn't have the benefit of giant robots kicking the sh*t out of each other. On top of this, the special effects were a little hit and miss. You seriously have to question why a film with the budget of 70 million can fail to hits the amazing heights of 2009's genuinely incredible District 9 which was produced on a tenth of that. Perhaps I am being overly harsh, and even a moan like myself can concede there's a time and place for these kind of films, but I could name countless alternatives which are simply more enjoyable, be it Independence Day, the first Transformers film, last year's sleeper hit Unstoppable and the impressive ensemble featured in Black Hawk Down. Have we told everything there is to tell with these types of stories? Battle: Los Angeles is in cinemas everywhere now. This one hasn't played in my home town yet and your review makes it sound unpromising. I absolutely agree with on Skyline as it was pretty bad and I was actually glade when it finished ! !